The new president of the entity, the Panamanian Esmeralda Arosemena de Troitiño, said that “it is an expression of civil society and that they are willing to listen to them. The appointment is on Wednesday, 13, at 5:00 p.m. 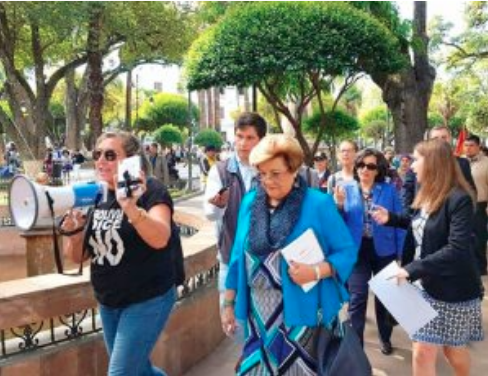 Moment in which the president of the IACHR, Esmeralda Arosemena de Troitiño, walked through the Plaza 25 de Mayo and was surrounded by activists who defend 21f. It was yesterday [02/08/2019] in Sucre. Members of the Inter-American Commission on Human Rights who are in the country’s capital for the 171 audience witnessed yesterday, closely, the protests of 21F activists who demand respect for their vote and reject a new nomination by Evo Morales and Álvaro García to the mandate of the country and that, nevertheless, they were authorized by the Supreme Electoral Tribunal to participate in the elections of next October. According to the newspaper of Sucre Correo del Sur, citizens with megaphones, posters, flags and shouts expressed to the commissioners their demand for respect for democracy. The outgoing president of the IACHR, Margarette May Macaulay, and the recent elect, Esmeralda Arosemena, toured the Plaza 25 de Mayo and behind them were the activists; who shouted their annoyance at the violation of the Political Constitution of the State; as can be seen in a video that was viralized by social networks. For its part, Margarette May Macaulay said: “There is no country or city without human rights problems, what matters is how cities and governments react to human rights violations that happen, which is the most important” . The Commission arrived last Wednesday to celebrate the 171 Period of Sessions until Saturday, the 16th of this month. Yesterday [02/08/2019] the visitors were distinguished by the City Council as “Illustrious Guests” and in their speech, the head of the deliberative body urged them to take special attention to events that occurred in the country and in particular in the city, such as the death of three university students in The Calancha. According to the newspaper Correo del Sur, the tribute prepared by the councilors was not far from speeches about the political situation and allegations of human rights violations in the country. “In recent years, November 2007, our rebellious people and fighting soul, during a Constituent Assembly, was again mistreated with the revolution of La Calancha, silencing the lives of our young people of Sucre,” said the president of the Municipal Council, Rosario López. Bolivian Thoughts opinion: The OAS of Almagro must be more efficient, they take time that people does not have. In the case of Nicaragua, it took them seven freaking years to come to an opinion?! That is NOT honorable to say the least! Bolivia needs the IACHR to rule against evo, he cannot run again for the presidency of Bolivia, simply because there was a Referendum, that he himself promoted and the majority of Bolivians said NO more evo!